You can easily prevent changes being made on any files or folders in Mac OS X by locking the file or folder in question. This locking capability will also prevent the file or directory from being deleted, since the Trash will not empty while a file is in a locked state. 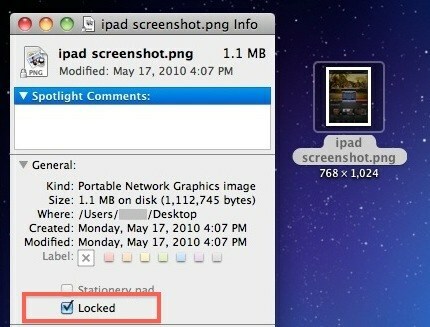 Locking files and folders in Mac OS X is quite easy, and the process is the same in all versions of the Mac operating system. You’ll obviously want to know the file(s) or directories you wish to lock down ahead of time, then proceed with the following instructions. The files or folders will now be locked, preventing any changes from being made to the file. Note this locks the file from changes and removal, but it does not password protect a file or folder like this image trick does. You can unlock a file in Mac OS X by reversing this process. Just return to the Get Info section for a chosen file, and by unselecting the checkbox next to “Locked” through the same Get Info panel you will unlock the file. Do note that if you are trying to unlock a file that you do not have privileges to you will need the admin password for that Mac. Once the file is unlocked, it can be modified or deleted again. Reversing the process does not work for unlocking in Snow leopard. I have even rebooted the laptop and still cannot unlock the folders and files. This does not work, tried it and file still opens without a pw…. This only prevents changes being made to the file. When I lock a folder on my desktop, I am unable to drag files into it or save files to the folder. This is very strange. I want the folder locked so that I don’t accidentally delete it, but I obviously want to still be able to save files to it. Does anyone know why I’m having this issue? I am unable to find an answer. Thanks. Locking the file/folder will prevent changes, but if it is deleted, a message will appear saying that “it is locked, do you still want to move to trash?” You can then empty the trash and your locked file/folder will be gone.